This feature enables you to create sales invoices based on your sales transactions. Click on the Create New Invoice button to create a sales transaction. A sales transaction form like following will appear in your screen. Fill in required information such as Date, Term, Due Date (automatically determined once the Term is already selected), Ref, Number, Salesman and Classification. Choose Customer's name. If the customer is not registered: click Add New to register a new customer. Choose Currency that you wish to use in this invoice. If this transaction involves a discount then determine whether the discount is based on value or percentage, in the Discount Using field. Select the Item/Service that you wish to sell. If the item/service is not registered, you can add new items by clicking on the Add New button. Add Description for the item/service you are selling. Determine the quantity in the Quantity column. Select the unit of measure in the Unit. Fill in your selling price in the Price column. Input discount amount in the Disc column. Determine the type of tax in the Tax column. 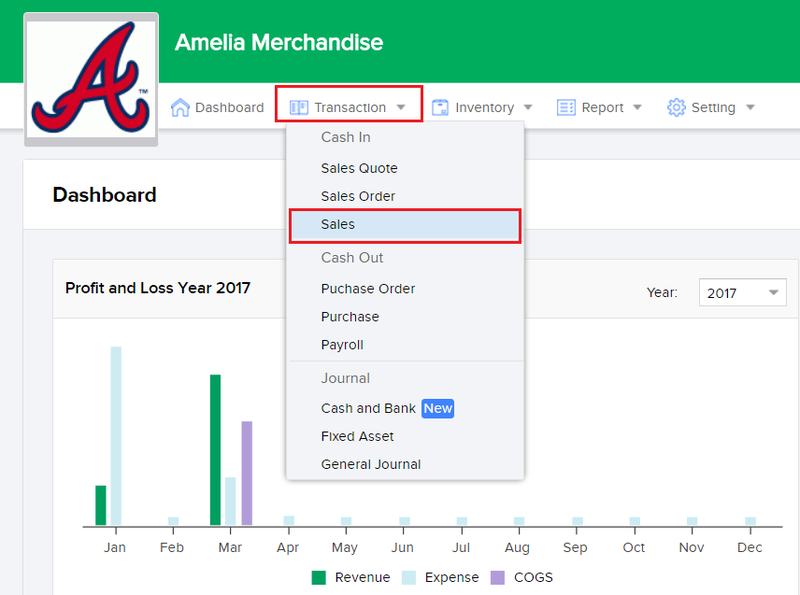 Choose the type of account that you wish to set towards Account Receivable when journaling, through the Account column. Click on Add Row if you wish to add more items/service entry. Add notes in the Note section if necessary. Fill in Withholding Tax in accordance to your company's regulation. Click Save as Draft if you still wish to edit the data at a later stage. Click Save and Approve once you are done editing and you wish to publish your invoice. Click Cancel to unod and cancel the invoice that you are creating.